A technical dissembling of the geo-psychological adventures unleashed on the world by the politics of colonial mapping, Mehretu utilizes etching as a kind of sculptural technique for breaking into the temporalities of painting and drawing. Searching for a finer edge, facing climate change and war, Mehretu opens up visions buried deep beneath the atelier. 22 works are on view—pieces that include collaborations with printmakers at Highpoint Editions, Minneapolis; Crown Point Press, San Francisco; Gemini G.E.L. in Los Angeles; and Derrière L’Etoile Studios and Burnet Editions in New York City. Mehretu experiments with techniques such as chine-collé or collaging lithography with screen printing, inking in dry point and aquatint mounted on gampi or Somerset satin paper. The editions in this body of work highlight an ongoing dedication to working with traditional forms from around the world. Though the prints intentionally deploy notational schematics, these maps contain no easily readable legend. There are overlapping allegories invoking studies of Hudson River School horizons and lessons gleaned from Jack Whitten’s use of magnetism in his own organic cosmologies. Aerial views of city intersections double as ancient brush and river beds, while patches of clear cutting help train our ear to the ground, as it is here and now. We look closely for the rhythms of motion across the surface of the paper; what emerges is an invitation to participate, wholeheartedly, in Mehretu’s visual and sonic alchemy. Stretching the definition of surfaces to include notes on the history of painting and the movement of peoples, Mehretu parlays abstraction through etching and acid wash to urgently press the question of which way to go. Playing against the hierarchy of fine arts and questioning our algorithmically determined futures, Mehretu creates painterly illusions of networks without paint. In a phone interview, Mehretu explained that etching copper plates stained with aquatint, then spraying them with sugarless rosin, emits “watercolor” tones onto the surface of the paper. Experiments with delicate revisions in tonal quality at different layers, on the same leaf of paper, become possible in ways foreclosed by working in pigment. Mehretu’s works, which will achieve epic proportions after this period of prints, allude to how a cosmopolitan’s psychic materiality is not merely made up of the number of places they call home. With the pressure of the print rollers (up to 9,300 lbs. across the entire roller, according to one collaborator), Mehretu unearths challenges that begin at the drafting table but cannot be resolved there. Ink’s fine impression on paper allows her staccato gestures to become an impassioned play with parabolas and wind currents conjuring the beauty of fractals. 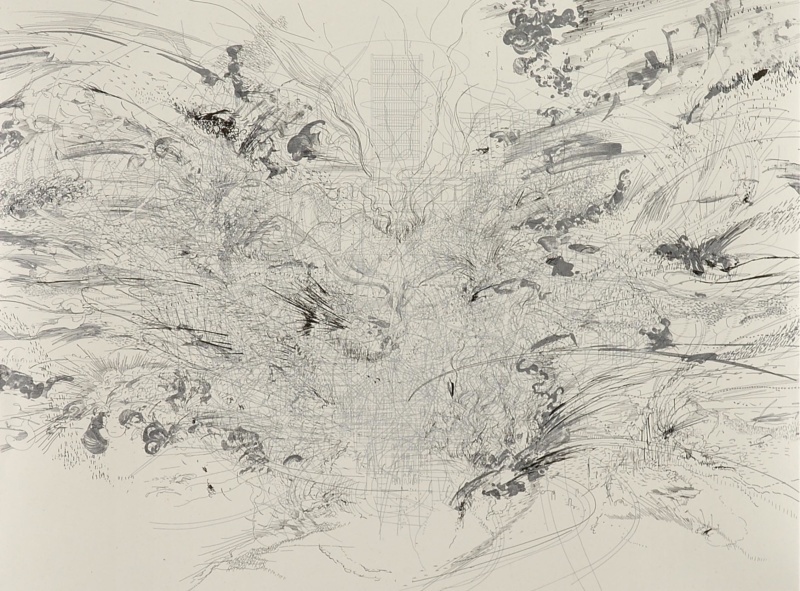 In Entropia (Review), Mehretu, who loves to draw more than anything, grapples with complex questions of mapmaking and its histories across cultures, colors and surfaces. An expanse bursts open at varying speeds and curvature; this movement slowly breaks down, revealing micro-cuts of time. Fine lines seem to invoke their own forms of color intensity, expressed through the abstract layering of screen prints and stencils. In other works, moments of bold figuration begin to prefigure canvases to come—mythical birds emerge, glyphs begin to surface, microbial forms seem to float above the picture plane. Emotive and present, cycles of seasons surge together with imaginary symbols of lost legends. In Mehretu’s patient collaborations with printmakers across the country, guided by her desire to ‘rehang the world,’ the artist cleverly abstracts the fine arts away from their chemical roots. These detailed contemplations of movement on paper offer prescient considerations for what it may mean to make our own mark on the world. “Excavations” arrives at the Sarah Moody Gallery of Art on the eve of Mehretu’s mid-career survey, which opens at the Los Angeles County Museum of Art this November and will travel to the Whitney Museum of American Art, New York, the High Museum of Art, Atlanta and the Walker Art Center, Minneapolis through 2020. 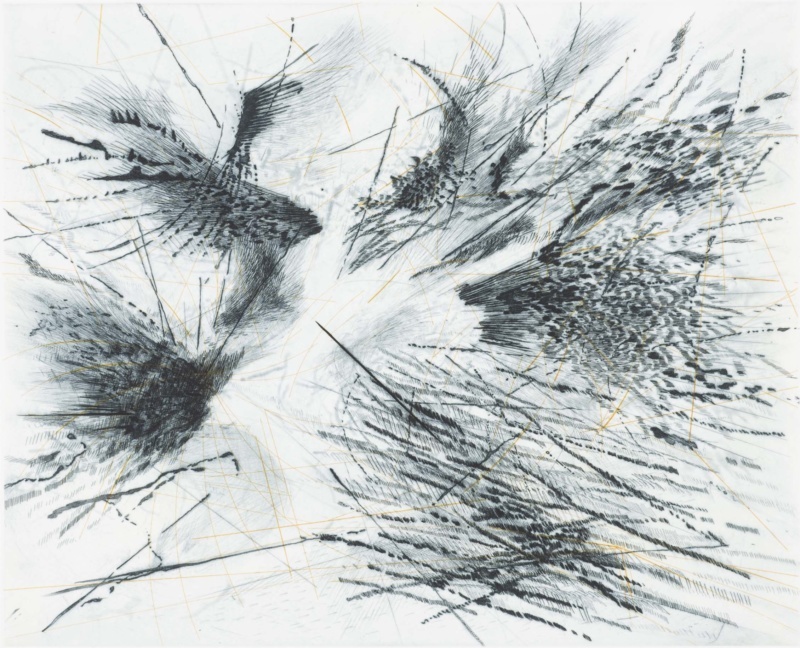 “Excavations: The Prints of Julie Mehretu” is on view at the University of Alabama’s Sarah Moody Gallery of Art through March 8, 2019.